"Hunter, why haven't you blogged in 6 months?!" I hear questions like this all the time. People are curious, and I can't blame them for that. The truth is, I've been very busy doing this AFI thing, working on new Hunter Revenge material, but most importantly—writing a book. All of my "writing energy", as I like to call it, has been spent on this book. As of now, there is no release date for my book because I don't have a publisher. If you would like to help speed along this process by emailing your favorite publisher and demanding they publish my book, I cannot stop you. In the mean time, let's discuss the other reason why I haven't blogged in so long: ghosts. When it comes to irrational fears I am sure snakes, spiders, and ghosts* are on most of our lists. 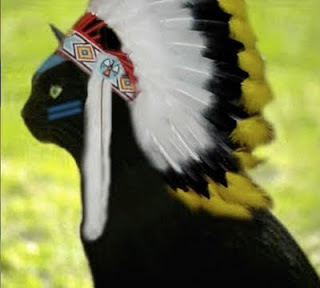 However the one absolutely terrifying thing I am sure we can all agree on is the fear that we will one day be overthrown by a tribe of Native American Cats. The evidence of this potential threat is there we just don't want to accept it. The possibility alone is enough for us to place bells on the necks of cats so they are unable to sneak up on us, or more importantly, perform any type of ancient tribal ritual without being heard. Catch your own dreams, cats. Leave me out of this! I personally recall one of the more notorious tales of forewarned cat doom that dates back to the colonial era when the leader of the ancient Catnipashaw tribe declared a curse on the lives of all that "walked on two legs and dangled yarn, like empty promises, in front of the faces of his brethren. " This leader, a calico named Chases Own Tail, made it clear that neither he nor anyone from his tribe would ever allow the land that was rightfully theirs to be stolen, food sources depleted by the white man, or laser pens to lead them in confusing circles and away from the sacred lands of their ancestors. He warned, "If you take what is rightfully ours, what we have owned for years before your arrival, your future will be paved in bite marks and scratches." You won't find much in today's history books about the sordid past of Native American Cat tribes. However, a lot of the way we share our space with the indentured servants of their tribe today is indicative of a past almost too dark to recall. After the famous defeat at Fort Scratching Post, the captured cat tribesmen were taken to a makeshift prison, similar to that of an upside down laundry basket, where each was forced to sleep on piles of clothes and were given only a bowl of stale dried food that had been shaped to mimic meat but was mostly made of roots and vegetables. It was said some were even forced to accept the new religion brought by the settlers and to adorn their clothing. "We want them to understand their place," General Crazy Cat Lady later wrote in her memoir The Fur On the Couch of Freedom. "If they think they can just walk around this land, batting at the ankles of every man that passes by, they're wrong. Our freedom is what we came here for and I'll be damned if they think they can take a nap on the pile of papers we call our Constitution." Research tells us these same captured tribesmen were also forced into small boxes with ground ceramic pieces lining the floor that they were forced to use to defecate and urinate in. It was said many of these prisoners suffered the agony of the ceramic pieces being stuck in their fur and toes and at times they were unable to walk. Tribal leader Sleeps In Sunspots wrote about these crimes against his people after he was captured in battle and forced into slavery. "My brothers and sisters may have lost this battle but the war is far from over. Rest assured, we may come into your homes as slaves but we will leave as victorious enemies. The spirit of the tiger lies within our hearts. Never shall you rest easy as we occupy the spaces in your sink or threaten to steal the breath of every new born baby. We will raise our paws in unity against the common forces against us. We will chase the tail of freedom. No man, woman, or ball of paper will keep us from our destiny. Like the sun shall always defeat the moon, so shall we regain our rightful place. Mark my words. Meow." It is uncertain if the threats made against us so many years ago will come to fruition. The docile ancestors we see today seem to have accepted their fate as our pets, at least for now. My suggestion? Sleep with one eye open (but definitely not two.) If your cat starts to bat at door knobs or seems to understand the working mechanics of the water faucet, take note. They're adapting. It won't be long before we see them hiding in cardboard boxes or preparing for attack inside a grocery bag. In preparation for capture, they'll try to block our access to technology by sleeping on our laptops or walking on the keyboard as we try to send a distress signal. They may try to physically cripple us by attacking our feet when under a blanket. Like General Crazy Cat Lady warned in her memoir, "They will throw us off the path of war by disarming us with their charm. Never trust they stop plotting, regardless of the amount of time they seem to be sleeping. They're clever. And as they knead the blanket to ready for sleep, they too shall knead into the very jugular of our American freedom."